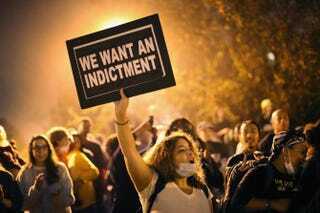 Demonstrators rally on the campus of Saint Louis University on Oct. 13, 2014, in St Louis. A Missouri lawmaker has accused St. Louis County Prosecuting Attorney Robert P. McCulloch of “manipulating” the grand jury in the explosive Ferguson, Mo., case to clear white Officer Darren Wilson in the fatal Aug. 9 shooting of unarmed black teen Michael Brown, the Associated Press reports. State Rep. Karla May (D-St. Louis) called for the investigation Thursday. McCulloch said in a radio interview Friday that some witnesses obviously lied to the grand jury, the report says. A joint House and Senate committee is already investigating why Democratic Gov. Jay Nixon failed to use National Guard troops in Ferguson on Nov. 24, the day the grand jury decision was announced. May sent a letter Thursday to committee chairman Sen. Kurt Schaefer (R-Columbia), urging that the investigation be expanded to examine whether McCulloch committed prosecutorial misconduct, AP writes. May says McCulloch helped sway the grand jury into the decision against indicting Wilson, the news outlet notes. “Many St. Louis-area residents believe—and there is at least some evidence to suggest—that Mr. McCulloch manipulated the grand jury process from the beginning to ensure that Officer Wilson would not be indicted,” May wrote, according to AP. In his first interview since announcing the grand jury's decision, McCulloch spoke Friday to KTRS Radio in St. Louis. “Clearly some were not telling the truth,” McCulloch said of witnesses who testified before the grand jury, AP writes. In addition, he referred to one woman who claimed to have witnessed the shooting. McCulloch told the radio station that she “clearly wasn’t present. She recounted a story right out of the newspaper” that backed up Wilson’s version of events, he said. The Aug. 9 shooting and the grand jury’s decision last month, along with other deaths of African Americans at the hands of police officers, has sparked ongoing protests around the nation against police violence in black communities.